Subject: Implementation of recommendations of the Seventh Central Pay Commission relating to grant of Special Security Allowance to NSG, PDG and RAF – regarding. A letter of Government of India, Ministry of Home Affairs, Police- II Division (PF-I Desk) bearing letter No. II-27012/34/CF-3396431/2017-PF-1 dated 31.08.2017 on the above subject, is available on the website of PCDA CC(pcdaacc.gov.in) for your information, guidance and necessary action. The Officer-in-Charge - For uploading the same in PCDA (CC) website. 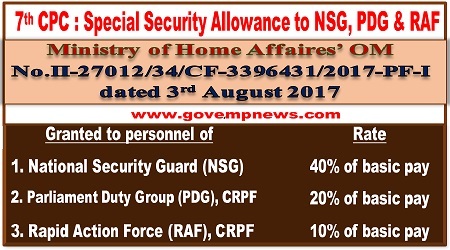 Sub: Implementation of recommendations of the Seventh Central Pay Commission relating to grant of Special Security Allowance to NSG, PDG and RAF - Regarding. The undersigned is directed to forward herewith a copy of this Ministry’s OM of even number dated 03.08.2017 on the above mentioned subject for information, please. 1. CRO (Accounts), NSG Headquarters, Palam, New Delhi-110037 for information. Sub: Implementation of recommendations of the Seventh Central Pay Commission relating to grant of Special Security Allowance to NSG, PDG and RAF – regarding. 2. The term ‘Basic Pay’ in the revised pay structure means the pay drawn in the prescribed Level in the Pay Matrix but does not include any other type of pay like Special Pay, etc. 3. The rationalized/revised structure will be applicable only to those employees who were already in receipt of the allowance, except in case of PDG employees. No new categories of staff in other organizations will be made eligible for the grant of this allowance. No Deputation (Duty) Allowance will be applicable along with this allowance. 4. These orders shall be effective from 1st July, 2017. 5. This issues as per 7th CPC recommendations in para 8.17.121-122 read with MoF’s Resolution dated 6.7.2017, as vetted by integrated Finance Division of this Ministry vide their Dy. No.CF-3396431/Fin.II/17 dated 3.8.2017. Director (IC), Dept. of Expenditure, Ministry of Fiance w.r.t. their OM No. 11-1/2016-IC, dated 11.7.2017.